*I originally wrote this post for The Idea Room, where you can find me twice a month posting parenting and family tips. It is getting a lot of traffic, and Amy was kind enough to let me post it here on Family Volley also. This is a topic that is near and dear to my heart. I think dads get a bad wrap. This Father's Day, and all year round, let's show them the love and respect they deserve. With Father's Day just a few days away, we are probably all looking for the perfect gift for the men in our lives. Ties, electronics, and sporting equipment seem to top the list of gifts we give to make the fathers in our lives feel special. But....Being a father is about more than golf clubs and it is important that we make dads feel special year round. Here are 6 suggestions for ways we can make the fathers in our lives feel special, all year long. You can't wrap them up in paper and ribbons, but they will make the men in our lives feel much more like the great dads they are. Fathers Want... to do Things Their Way. As women, it is easy to feel there is a right and wrong to the way things should be done around the house, and with the kids. The dishwasher should be loaded a certain way, putting the kids to bed should be done a certain way, and folding the children's clothes should be done just so. But that is not the case. There are lots of ways to load dishwashers, fold clothes and make kids feel special at bedtime. 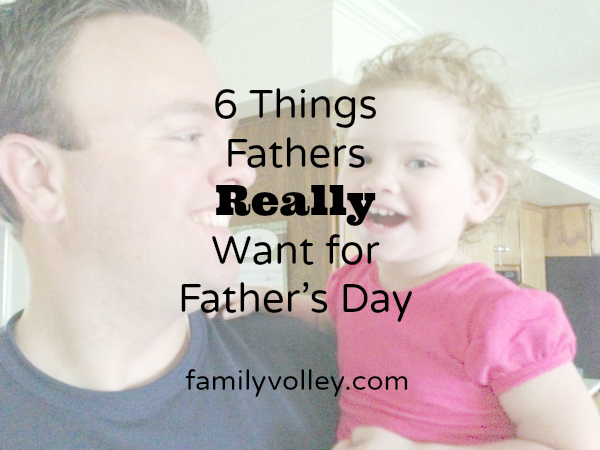 Instead of making our husbands feel like they have to do things our way, step back and let them be dads their way. They come with a whole life of experiences and expectations they want to apply to parenthood also. So let them. We should never make them feel guilty or wrong because they do things differently than we do. Plus, if we are constantly unwilling to accept the effort they are putting in, they will stop putting in the effort. Fathers Want... to Teach and Share. As a mom, I want our kids to learn and love all the things I did as a child. I want our kids to learn to play tennis, and swim and doodle and draw. But we need to realize that fathers want to teach their kids what they know and love too. I recently learned this the hard way as I was talking to my husband. He grew up hunting, I did not grow up in a family that participated in that type of recreation. If we are being honest, it scares me. The two of us were talking two weeks ago and he mentioned it was time to teach our son to shoot a gun. I tried to be understanding, but couldn't help but express my concern. After we went back and forth, with me questioning why it was necessary for these skills to be taught, things got a bit quiet. Then my husband spoke up. "You know, I would love to teach our kids things I did growing up too." Ouch! I know this concept, but had neglected to live it. I had never even thought about it that way in our home. Don't learn the lesson the hard way like I did. Realize that they are excited about sharing themselves with your kids also. We married them after all. We need to trust them and let them. Fathers Want... Us to Love Them. It is easy over time to let the little quirks or habits our husbands might have, start to bother us. But remember, it is probably those little quirks that we fell in love with in the first place. We have plenty of our own quirks and habits. I know I don't want my husband pointing them out all day. Love the father of your children just the way he is. Even if there are socks on the floor. There are much more important things in this life, than that. Fathers Want... to Help. Take all the help they give and ask for help too. I am horrible at this. The kids will ask my husband for help with something and from the other room I holler, "it's okay, just bring it here, I will help you,"...or "come here, I can do it." There is no need for that. I don't need to take away opportunities for him to help and for him to be a dad. Nor do I do it any better than he does/would. I have noticed I tend to jump in more when they are asking him to do things that usually fall under my "mother role". Help getting dressed or getting something to eat, or making their beds. Or I feel guilty because I didn't get it done first. I also catch myself not wanting to burden him. But he does't see it that way. Don't take away their opportunities to be a dad and ask for help. Father Want... Credit. We have to be careful with the words we use. Saying "my children" all of a sudden takes dads out of the equation. Or "I have four children." It is a really simple thing, but they are his kids too. When we are talking, use "ours" and "we". "We have four children". "This is our son." Even if he isn't around. Father Want... You to Stop Saying Mean/Embarrassing or Critical Things About Them. It can be easy to be with girl friends and start sharing critical things about the father of our children. We say them out of jest, or to be funny. But if roles were reversed, we would be really hurt if our husbands talked about us that way. Don't get caught up in the conversation. Always say positive and kind things to others about dads. A nice new tie or sushi dinner will make my husband happy this Sunday. But he will feel even more special if I can remember to treat him like the great dad he is, year round. Happy Father's Day to All The Wonderful Men in Our Lives! What are you giving your Father/Husband for Father's Day this year? Anyone else a little afraid of what your hubby wants to teach the kids? Well said. Also, well done in your own life/marriage. I learned early in our marriage to never talk/complain about my husband, even if he wasn't around. I had a friend who was CONSTANTLY putting her husband down and it really bothered me, so I swore I would never do it. (That friend is now divorced.) It's an unseen, unheard gift, but one that gives so many dividends.